IP Address or Internet Protocol address to expand, is a unique string of numerics which is assigned to each computer or device that is part of a computer network and enables the devices and/or computers to communicate securely. This unique combination of numbers serves chief functions of networking protocols. These IP addresses thus are used to determine the precise location of all the individual devices geographically, and as well the host address to which the devices are connected to. On TCP/IP network, the unique 32-bit combination of numbers exactly identifies a host that maybe a personal computer, a laptop, tablet, and even printer and routers. Expand your knowledge of CASB IP Restriction solution. Nowadays, as Cloud Computing with host of benefits for IT firms overshadowed the IT arena with multiple cloud apps running simultaneously rendering mobility to the network resources with the flexibility of creating a network of devices located miles apart, employees as well as organizations are benefiting hugely because of the increased expanse of the network alone. It has created an all-time conducive environment for all to work 24×7, 365 days a year, largely contributing to all-round performance in this service industry. But the catch lies for the companies as to how effectively and efficiently they can manage multiple IP addresses over a single large network and may have sub-networks, without risking their confidential data from leakage or getting into wrong hands challenging the overall enterprise security. 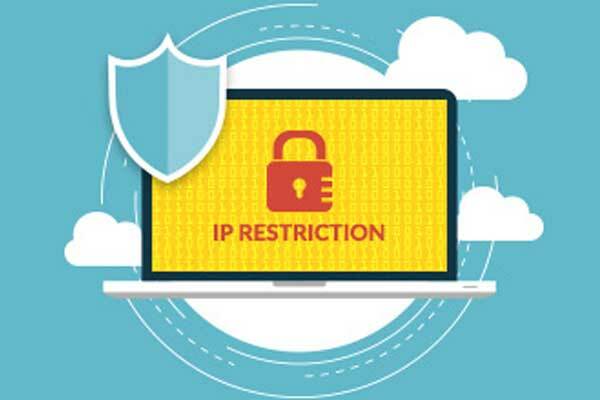 Thus, Cloud Security is the biggest challenge any organization has to accept while moving to cloud is to protect their confidential data, which consumes multiple IP addresses placed miles apart, far from in-person reach, in cloud environment. Though it is easy and quick access from anywhere and anytime for employees, the cybercriminals too are upgrading their technology to unearth the most crucial data they steal from companies network resources. This ease of access from multiple locations using multiple IPs is more of a burden at times on organizations when their critical data is lying insecure, and it is a real cloud security threat that is keeping many organizations away from reaping the benefits of cloud computing. Usually, data thefts or breaches are committed either by the employees of the same organization they are working for or sometimes from outside hackers who are targeting crucial data for personal gains. In any event, of utmost importance is to keep the data secure anyhow. CASB solutions of any Cloud Access Security Brokers are a new arm in cloud computing that counter-act against evil instincts of cyber thieves. It not only keeps the rotten apples out of the cloud basket, but also restricts the activity to a limited space. A CASB solution bridges the gap between cloud and the organizations and enables the organizations to keep their data safe and protected at all times even if it is being accessed through multiple ports. The organizations landing on cloud-based operations can easily create and design one-on-one policies as well as group-policies to exactly define and restrict the data flow into the various channels of their corporate network. When CASBs emerged in the year 2011, they were perceived as cloud-visibility solutions across 4 pillars of compliance, threat-protection, visibility, and cloud data security. As per Gartner predictions, by year 2020, 85% of firms would be already using a CASB solution for securing their cloud-based apps.